Digicel’s Sponsorship and Development Manager Kamal Powell commenting on the gifting of three Samsung Galaxy S7’s to lucky patrons at Bacchanal Fridays’ ‘Digicel Night’. 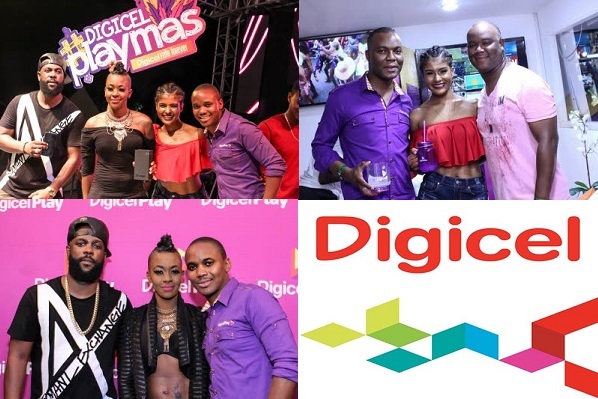 Digicel sprang quite a surprise at the Bacchanal Fridays’ ‘Digicel Night’ on Friday March 18th 2016 by launching the Samsung Galaxy S7. I say surprise as Digicel’s Sponsorship and Development Manager Kamal Powell literally interrupted the set of Soca’s power couple, Fayon Lyons and Buji Garlin to present them with the S7, as shown below. Yes, you’re not seeing things, dear reader! That’s Amita Persaud-Webb, Digicel’s 2016 carnival promotions representative. Here’s another picture of her with that Digicel Mason Jar that was on offer that night. This all hints at a Launch Event coming sometime later on March 29th 2016 for the Samsung Galaxy S7 on both Digicel Jamaica and FLOW Jamaica’s Networks. Hint: the Samsung Galaxy S7 is waterproof as pointed out in Samsung Galaxy S7 and S7 edge makes a big splash at MWC 2016, a point which will feature heavily in ad campaigns for the smartphone. Also, it suggests that Samsung might feature heavily in the Bacchanal Road March on Sunday April 3rd 2016, possible used for photography as noted in How to take High Quality Photographs with the Samsung Galaxy S6. So folks, stay tuned, as a S7 Launch event is around the corner!